Hamilton has a climate that is oceanic (Köppen: Cfb ), and is highly moderated, featuring warm summers (some of the hottest in New Zealand), cool winters and about 1,184 mm (46.6 in) of rainfall annually. Daily maximum temperatures range from about 22 to 26C (72–79F) in January and February to 10 to 15C (50–59F) in July and August. The highest temperature recorded in Hamilton was 34.7C (95F), and the coldest temperature of −9.9C (14F) – the lowest of the major New Zealand cities. Summer occasionally sees temperatures of more than 28 °C (82 °F), while on clear winter mornings temperatures may drop to as low as −4 °C (25 °F). Ground frosts are common and snow is possible but rare. The only recorded snowfall in modern times was light snow flakes in mid August 2011 during a prolonged cold period that saw snow fall as far north as Dargaville. Typically summers are warm and dry and winters cool and wet. On average, Hamilton sees around 2,000 hours of sunshine each year (see table below). Hamilton is growing annually, with populations of 224,000 for the urban area and 156,800 for the territorial authority (June 2015 estimates). 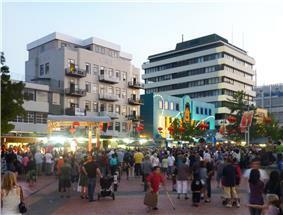 According to official census figures, Hamilton's population is 69.5% Pākehā/European, 21.3% Māori, 13.8% Asian, 5.1% Pacific Peoples and 2.0% Middle Eastern, Latin American and African. More than 80 ethnic groups are represented within Hamilton's population. The main area of population growth is in the Flagstaff-Rototuna area. With its large tertiary student population at Wintec and Waikato University, approximately 40,000 tertiary students, Hamilton has a significant transient population. 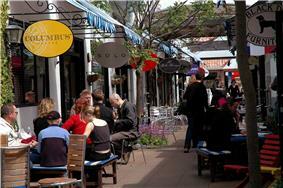 Hamilton is the second fastest growing population centre after Auckland. 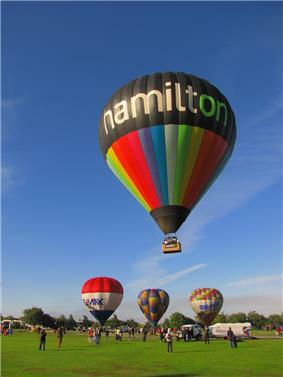 Hamilton is located in the administrative areas of the Hamilton City Council. The council consists of thirteen councillors and a mayor (currently Julie Hardaker), elected in 2010 and re-elected in 2013. 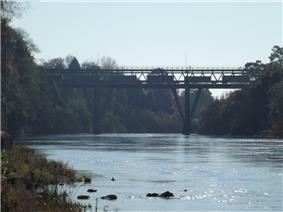 The council has two wards (constituencies), east and west, with the boundary between the two being the Waikato River. Council elections are held every three years and most recently in October 2013. Hamilton West: Sue Moroney (Labour). 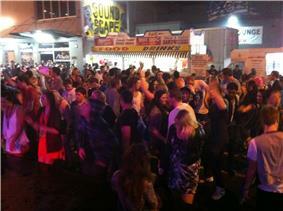 Hamilton is host to several large scale music festivals including the University of Waikato, Conservatorium of Music. The local rugby union teams are Waikato (ITM Cup) and the Chiefs (Super Rugby). The local colours are red, yellow and black, and the provincial mascot is Mooloo, an anthropomorphic cow. 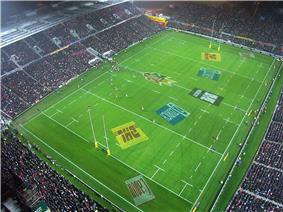 Both teams play at Waikato Stadium. Hamilton is also home to a football club, WaiBOP United, that competes in the ASB Premiership during summer. The winter football clubs Hamilton Wanderers and Melville United both compete in the Lotto Sport Italia NRFL Premier League are also based in Hamilton. Rugby league is also played in Hamilton with the two local teams; Hamilton City Tigers and Hamilton Hornets/College Old Boys play in the Premier Division of the Waikato Rugby League. The major daily newspaper is the Waikato Times. Weekly community newspapers include the Hamilton Press, Hamilton News and student magazine Nexus. 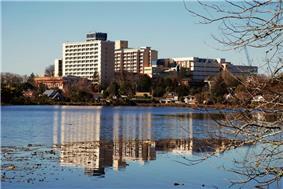 Hamilton's public hospital is Waikato Hospital with 600 beds and a staff of approximately 2,500 located between Melville and Hamilton West. 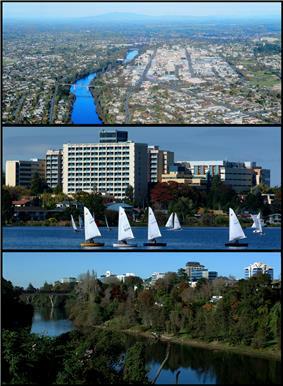 There are two other major private hospitals in Hamilton City; Braemar Hospital, located in the same area that Waikato Hospital is located, and Southern Cross Hospital, located in Hamilton East. A new cancer hospital is due to open in November 2010 on the previous Braemar Hospital campus. Hamilton also has a two private primary maternity hospitals, which are fully funded by the Waikato District Health Board, Waterford Birth Centre and River Ridge Birth Centre. Hamilton International Airport serves as a domestic airport. 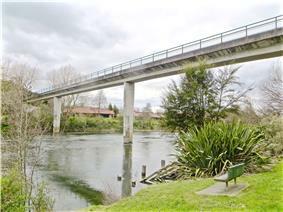 It is jointly owned by Hamilton City and neighbouring district councils. 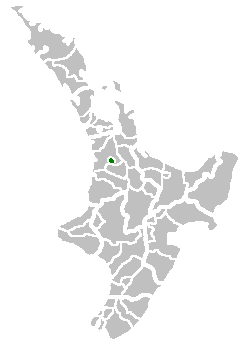 The airport is located just outside Hamilton's boundary, within the Waipa District. There are direct flights with Air New Zealand to Auckland, Christchurch, Palmerston North and Wellington, and with Sun Air to New Plymouth, Gisborne and Tauranga also there are charter flights to other destinations throughout the North Island. The airport also served as a major base for now defunct low-cost airlines Freedom Air and Kiwi Air. Virgin Australia offered three international flights a week, to and from Brisbane Airport and Sydney Airport. However, all international flights have now been discontinued, primarily due to a small market. 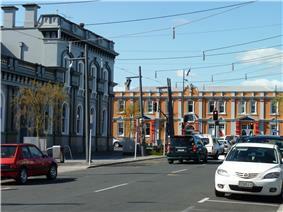 Hamilton has extensive cycleways which link the city center with the outlying suburbs. 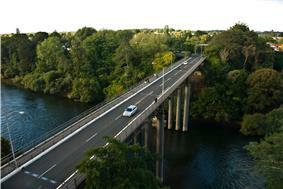 These cycleways consist of a mixture of dedicated cycle lanes,which are 1 metre wide strips either coloured green or with a painted outline of a cycle and mixed use cycle/walk ways which are mainly located alongside the Waikato River. ^ a b c d Wises New Zealand Guide, 7th Edition, 1979. p. 129. Stan Walker, Australian Idol Winner and singer/songwriter, educated in Hamilton. Terry Wiles, thalidomide victim and subject of the film On Giant's Shoulders (1979). Despite the improvements there have been on-going problems. In 2012 the council was prosecuted for a sewage sludge spill and consent conditions were breached in 2013 due to a bacteria problem. In 2014 up to 800 m3 (180,000 imp gal) of untreated sewage got into the river. From river level the water is pumped up to 8 reservoirs, which uses 410 kWh of power for each million litres of water pumped. Average use in 2010 was 224 litres per day per person. The 2006 population was 129,249, so total annual consumption was a bit over 10,000 million litres, using over 4 million kWh. For maps and description of the distribution system see this 2001 HCC Strategic Planning document. In 1902 a poll of ratepayers approved borrowing £5,000 to set up a water supply. In 1903 3.2 kilometres (2 mi) of pipes supplied water to 80 properties in Victoria, Anglesea, Collingwood, Clarence and Selkirk streets and the borough turncock reported average use at 15 imperial gallons (68 l) a day (average consumption is now 224 litres (49 imp gal) a day). 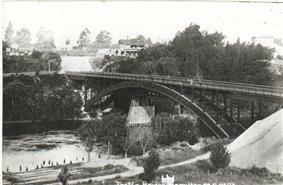 By 1908 nearly all of Hamilton West had piped water, extended to Frankton and Claudelands in 1912. By 1916 a 75 feet (23 m) high water tower on Lake Rd had been built to give extra pressure, mainly for the Fire Brigade whose station opened in 1917. Until 1939 on Sundays visitors could climb the tower for 6d. 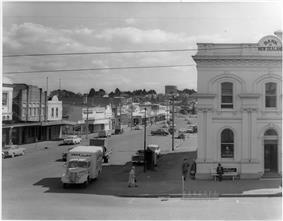 The tower was rebuilt further up on Ruakiwi Rd about 1966. A treatment works was built in 1923, using candy filters and supplying water at 75psi. As well as gas, coke, tar and tar paint were produced. 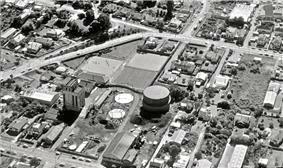 Waikato coal was mixed with coal shipped via Greymouth and Raglan from 1964 until 25 March 1970, when the gasworks converted to natural gas. The works closed after the 363 km (226 mi) x 14 inches (36 cm) Kapuni and 307 kilometres (191 mi) x 34 inches (86 cm) Maui gas pipelines to Huntly were built in 1970 and 1973. The site was cleaned up after demolition in the 1990s, but is still monitored by Regional Council for contamination. In 2012 Vector replaced the low pressure cast iron network pipes with new medium pressure pipes. .goodwill half of which was for  A 1907 referendum authorised the city council to take over the gasworks. In 1911 the Privy Council set the purchase price at ₤34,402/14/3d ($5.5m at 2015 prices),It also allowed the city to purchase after 12 years at a price determined by arbitration. A telegraph line from Auckland came shortly after the invasion, reaching Whatawhata, Te Awamutu and Cambridge by October 1864. Telephones came to Hamilton from 1882. Hamilton got a telephone exchange in 1904 with 39 subscribers. Hamilton telephones were put on an automatic exchange between 1915 and 1920. From the 1950s Hamilton was linked into the network of microwave towers via the towers at Te Aroha and Te Uku. 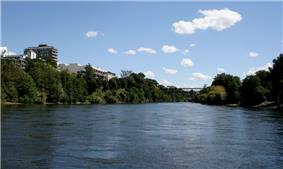 By 2012 Hamilton had over 500 km of fibre optic cable, allowing broadband speeds over 10Mbps in much of the city.